We often talk about horses being great levelers… and bow, Queen Ava, you take the crown this year! Ascona M is a raw talent and she will undoubtedly get her 4 star glory…she is just 10 years old and already has a CCI 3 star win and a 3rd under her belt as well as a 2nd and 3rd at CIC 3 level. She played with her debut 4 star test to lie 4th going into cross country and began her round today with the confidence and quiet arrogance that her scope and bravery allow her to do. Pau is a twisty and turning track… no other start gets you to jump fence 1 and then promptly do a 180 degree turn back to fence 2! But Ava was eating it up and Tim’s forward riding ensured an easy passage through the first water with a brush followed by 4 forward strides to a bank and one stride to an angled brush. 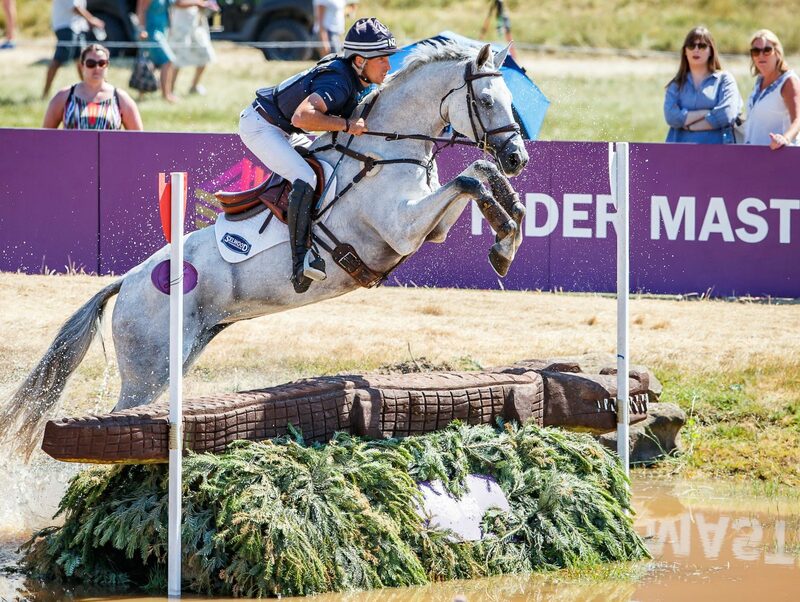 Tim rode it beautifully with a collected and engaged canter, ready for whatever Ava did.. she rather launched in ( photo above at Barbury CIC 3 demonstrates she is a spectacular water jumper!) and then she lost her balance and did some sea horse strides in order to stay upright. She stayed upright but decanted Tim off to the right in the process and left him in the drink. It looked cold in Pau today and I felt sorry for TP! When Xavier Faer ( Hugo) made his mistake at the water a couple of years ago he came back for Tim but Ava has no such manners and she was off in a spectacular extended trot to check out some more of the track! Ava is one independent lady and having never dropped a rider cross country before she was pretty pleased with herself and showed the crowd that she was sound, fine and pretty damn happy! It was an odd day in Pau for sure. Out of some 60 starters just 38 came home. Today saw William Fox-Pitt, Phillip Dutton, Oliver Townend and Tim Price on the deck and riders like Boyd Martin & Andreas Dibowski retire. Some random riders completed after hairy rounds and just three horses made time. So that’s a wrap on eventing for 2018. Neither Tim nor Jonelle had the end of season finish that they wanted but hey, that’s eventing. If anyone had told us at the start of the year, amidst the Beast from the East followed by so much rain that Badminton was in doubt, that Wesko ( Dash) would make his comeback and that Classic Moet ( Molly), Faerie Dianimo ( Maggie May) and Ringwood Sky Boy would all notch up 4 star wins no one would have said no to that! Add into the mix Hester’s 2 star win at Camphire, Pats Jester’s ( PJ’s) win at Blair 3 star… yup, you know what? I think they are doing ok!